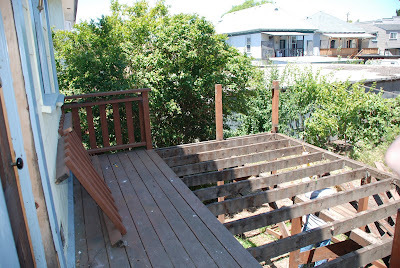 That was the original deck footprint -- all the way to the edge there, albeit with more boards. Staircase on the right. This is looking the other direction, from the top of the staircase. Notice how you can see all the neighbors' yards from the deck? Nice if you're into that, I suppose. Not the view I want with my morning tea. 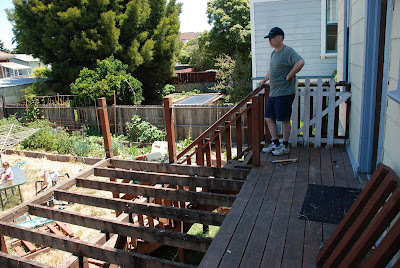 Later, the deck has been reduced to its future depth -- just as deep as the landing needs to be. The staircase is doomed also. My jobs were pulling nails and stacking lumber neatly. This week, I get to grade the new patio area and order gravel. If I work really fast, I'm going to start building new beds. I suppose weeding will have to fill in there somewhere; I've foolishly let waaaay too many foxtails go to seed. A shop vac, perhaps? 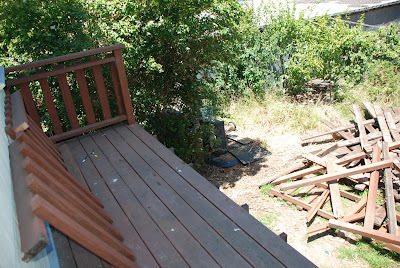 This is the "new" and diminished deck. The stairs will be moved to the left here, so you'll have to turn out the door to go down. That way, when we're on the patio, the staircase won't bisect the view of the garden, but sort of frame the sitting area. 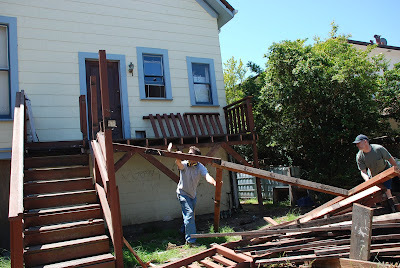 That pile of "old deck" is going to be "new gardens" at some point! That will be great when you are all done. 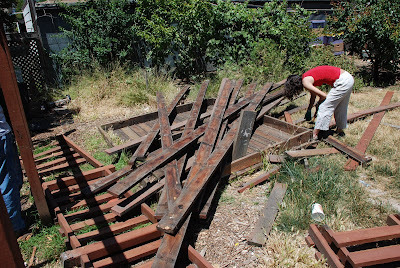 Making more garden space is a great way to use all the boards from the deck. Can't wait to see more! I am so excited that even the thought of shovel work in the heat today isn't making my spirits flag too much. I like how you have a vision of your yard in your mind and you are all working together to make it happen. Garden Now - Think Later! Inside-out Ravioli.. or as they are called in Tuscany, Ignudi! No words. Just the first ripe Sungold. Can I call it succession planting?